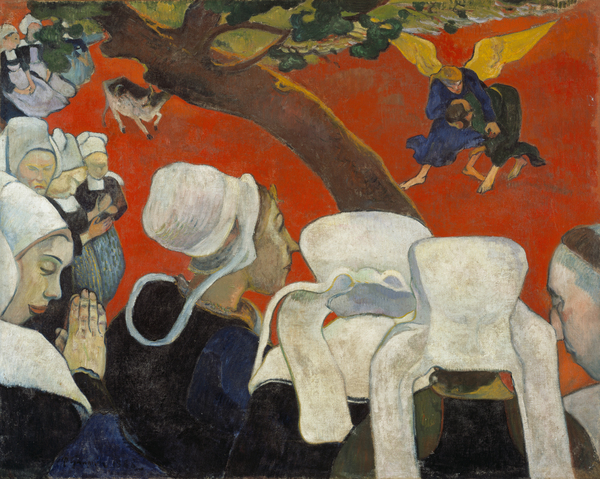 Nasema Nawe draws upon Paul Gauguin's (1848-1903) Vision of the Sermon (Jacob Wrestling with the Angel) 1888, one of the most popular works in our collection. Just as Gauguin's picture concerns the revelation of semi-illicit religious activity, Armitage has depicted a similar communal ritual; the controversial and highly sexualised Baikoko dance which originated on the coast of Tanzania. Performed only by women, it has been popularised in recent years through its appearance in Bongo Flava music videos but, due to its sexually explicit nature, the dancers have faced increasing restrictions by the Tanzanian government.